A composer of classical music, a singer, a teacher, a wife and mom (3 great kids and world’s best husband), an active blogger and ircster, a decent amateur cook, a wine snob. Pretty far left in politics. And more. I found your blog when looking for Icelanders. 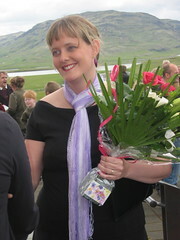 I have just written a novel in which part of the story takes place in Iceland. I assume you speak English because your „About Me“ is in English. I have a favor to ask of you. Would you be willing to look at the Icelandic (only a few lines) that I have used in my book, and tell me if I have translated correctly? I used an online dictionary, but decided I may be writing something that I least expect! I am also a teacher, have three great kids (and one great dog) and am pretty far left! What is an ircster? Yes, I do speak fairly decent English. Of course I’ll read through your Icelandic, would be exciting to read the book, actually. Just tell me where to look at it. Oh, sorry, can’t you answer to the address I’m sending from? Not sending from the blog page, here. Or the sig? This is the same „Steve“ that is over at Aldas site. I`ve been meaning to stop by and say *hi* and never quite manage to. I see that you`re a teacher, what do you teach? Three kids, yep, here also. Three girls, ages 14,16 and 18. My apologies that I don`t speak a word of Icelandic, however I was quick to notice the *BC* comic strip and the photos of Iceland. *BC* was my favorite strip as a child and still one of my favorites. Do you see much of *Calvin and Hobbes* around there? If not, try and have a look, as it is one of the best, in my opinion. Meanwhile, I`ll just enjoy your pictures. I teach music, theory, aurals and composition, I’m mainly a classical composer and I sing too. Quite a varying job, especially since I teach at 3 schools, a local Suzuki music school, a regular music school and the Academy of the Arts. 3 kids, yeah, girls 16 and 12 and a little boy, almost 8. Feel rich. HAHAHA! You`ve got that right about the *IRS* We pay about 38% in income taxes, plus all the other things that are added on, 6% sales tax [in this state, other states vary] road taxes, fuel taxes,property taxes and so on. GRRR! As you may have guessed, you hit a nerve. 🙂 For a little insight as to what may lay ahead, *ZITS* is pretty good. The author is pretty observant, and at times hilarious! I`ve ‘worn a lot of hats’ in the past, however, currently I`m enjoying an opportunity few fathers ever get, a stay at home dad for the last ten years. Lots of time for the girls! The other thing I do is photography. Over the years, I`ve made my living doing commercial/industrial type things, weddings etc…Currently, large format black and white landscape, done with traditional materials is my passion. Oh, I forgot to mention we live Michigan, about an hour north of Detroit. Yep, we`re in the throes of winter here too. Guess music’s my life, yes. Do you have any of your photos on the internet? Would be interesting to see. And brilliant to be able to be a stay-at-home dad! congratz. Computer savvy I`m not, therefore, no website. Additionally, I need a scanner that can scan 5″x7″ negatives. The other problem is that the files are HUGE, as in 750 meg. or so. Right now, I`m working on a laptop, and 150 meg. files make it grunt. The I-Macs look very promising, as soon as I can come up with a spare 3-4 thousand. Meanwhile, I`ve been improving my skills with the digi-gizmo, to where it is becoming a useful tool, rather than just for snapshots. Be glad to e-mail you some, just need an address. Okay…I`m going downstairs to finish framing a print that I started a few days ago. This only the second digital print I`ve done that was deemed worthy of a frame. I’m a real Mac fan, now my computer’s a MacPro, quadruple core, 5 gigabytes RAM, probably way too powerful for me, but hey! Computer freak, me! Being a mom with three kids make you VERY busy, I understand completely. Curious though if my last few e-mails have made it to you. Okay, time for me to get caught up…A chocolate egg with Milka bars inside…Yum!, I ‘discovered’ Milka bars when I lived in Austria. They`ve been a long time favorite. When will the egg be broken open and by whom? Sunday morning? That`s a great puzzle! Puzzles generally provide many hours of entertainment for Nina and the girls on rainy weekends at the cottage. [My parents place in northern Michigan] As I like to hunt and fish, weather rarely keeps me indoors. As long as I can keep the cameras from drowning/freezing/melting, that`s my entertainment. And, Happy Easter!, to you and your family. We buy 3 easter eggs from a local chocolate factory, Nói-Síríus, they’re pretty good. Then Fífa, the eldest, and my husband make their own eggs, those on the photos. I and the younger children think it’s too much bother. So everyone gets their own egg. Inside the eggs there is a lap of paper with a proverb or saying, I think that’s a nice custom. Milka chocolate’s also excellent, though it’s not easy to get here. Sometimes see it, though. Steve, well, the central part of Reykjavík’s in a decrepit state, conglomerates have bought loads of houses and mean to tear down and rebuild, but as of now nothing’s really happening. The houses stand empty and of course fall victims to graffiti „artists“ (not saying there aren’t graffiti artists, but well, look at the strip). The man is the current very unpopular mayor who seems rather to want to hide behind the bushes than to do anything about the situation. That`s a surprise. I would not have guessed that Reykjavik would be having the same problems as so many other urban areas. Same thing happens here all the time. No one ever seem to vote for these people, yet they remain in office! I worked as a firefighter for 15 years in a city of 165,000 people, and the only time we ever heard from the politicians was at campaign time when they hoped they could count on our vote. As far as I know, none of them EVER kept a single promise. As you might expect, I`ve a pretty dim view of politicians in general, and the ones that I`m familiar with in particular. Heh, isn’t that the truth! I`ve read several different things about one of the churches being „controversial“, but none of the articles seem to elaborate. Is it the design of the building, or something else entirely? Frikirkjan, I believe that was it. Possibly someone whining about the architecture? If you don`t like the church that you`re at, can`t you just go to another one? For my parts, I regard it as a just attempt to leave the Icelandic public out of this vicious attack on Icelandic banks. No one has profited from this in Iceland except a small cadre of a few shadowy bankers and speculators who are now expatriate. Quite many have lost their life savings. It is possible that we all might lose our retirement funds. Yet we are decried as scoundrels or even terrorists by the British and even spat on and refused service. We think we don’t deserve such treatment. I found your blog for a case, ’cause I looking some icelander people to meet. Im Italian from Rome, I musician too, I play trombone in jazz and improvise music. Since when was child, Im started to love you country,(I dont know precisely why) I remember that I stayed for hours to watch the island’s map learning all that strange village’s name and immagining the life. But until now I never been there. Now i have decide to come in iceland not for a short period, but long. i need to take a break from here, that really a nation falling in ruin, socially, politically, ecc. I need to immerge my self into the four elements, i need to have a spiritual trip and looking for silence, space and the nature’s wonder and the iceland Im sure is the ideal for this point. Plus I know that there, there is a rich experimental artistic scene, that I would like to meet and know nearly. in prevision to adjust my future trip. maybe speak you a bit italian too? Sure this is a good place for silence, we have incredible spaces of nature that are uninhabited and fairly easy to get there too, not far from Reykjavík. where you can listen some of my experimental music works. of chamber, get something like at list 24.000 euro each months? insure, restaurant, theather and cinema, and more more…)and many employeer live whit at least 1000 euro each month, often to paying 500-600 euro for flat’s rent..it’s disgusting. for my icelandic trip…do you think is possible stay there in a cheap way? hi, will check your page. Agree on the wage difference it’s horrible! I’m sure we can find some place, a Norwegian friend of mine found a cheap hostel not far from the centre of town, can’t recall at the moment what it’s called but will find out. The ISK (króna) is pretty low now and not looking to get higher anytime soon so I’m sure the cost won’t be overwhelming. Hi Gerald and thanks for the interest. Will be in touch. a manual of conversation italian-iceland. Existe it? Hm, I don’t think that it exists, unfortunately. Here by us was sunny, but we had many rain in the week. We live in Tuscany, Montecatini Terme near Florence. Fairly cold and windy but sunny. Window weather we call it 🙂 We live in Reykjavík. information I would be very grateful.